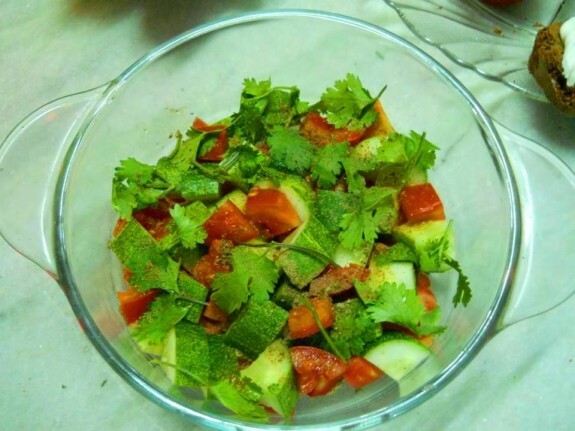 Pure Veg Salad is simple to make which is very quick and easy salad recipe. This is too healthy recipe with all types of proteins and nutrients include in this. Have this salad anytime a day. 1. Cut cucumber tomato capsicum and onion into dice shaped. 2. Now take a bowl and add the vegetables. Add salt, black pepper powder and chaat masla powder. Mix it well. 3. Now add olive oil and lemon juice. Mix all the ingredients well. 4. You can serve this instantly or keep this in refrigerator for half an hour and them serve.